Something old, something new, something borrowed, something blue, & a SILVER SIX PENCE IN HER SHOE. Did you know that the end of that rhyme is a silver six pence in her shoe? And if you did, do you know why you are supposed to put a silver six pence in your shoe on your wedding day? What is a six pence? The sixpence was a a British form of currency worth a 40th of sterling, or six pence. In England, the first sixpences were struck in the reign Edward VI in 1951 and continued until they were obsolete in 1971. How did the six pence tradition begin? 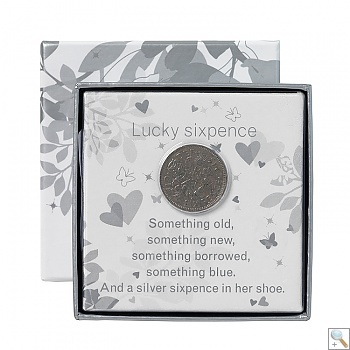 Some families have passed down the same sixpence through the generations to continue the hope for good luck to future brides. It’s also nice to seek out a sixpence minted in the year of your parents or grandparents wedding, birth years, or some other important family occasion. So on your wedding day don’t forget your something old, something, new something borrowed, something blue, and a silver six pence in your shoe. This entry was posted in New spin on old traditions, Wedding Traditions Tuesday and tagged bride to be, detroit bride, detroit weddings, event planning, michigan brides, michigan weddings, ohio brides, ohio weddings, serendipity weddings and events, silver six pence in your shoe, something old something new something borrowed something blue, wedding planning, wedding traditions, weddings. Bookmark the permalink.